It’s the 30 years anniversary of the Catagolfe regatta…..
and the French Tornado olympic gold medalists Nicolas Henard and Jean Yves le Deroff are also sailing the event! 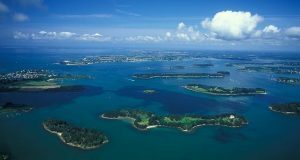 There will be raids with about 140 catamarans, foiling, f18, diam24 series in the golfe du Morbihan which is a great place to sail. For the moment there are 7 Tornados register for the event. You are all welcome to join this amazing event and sail in an exciting race area! !